The MA student in the Islamic Art and Architecture program talks inspiration. 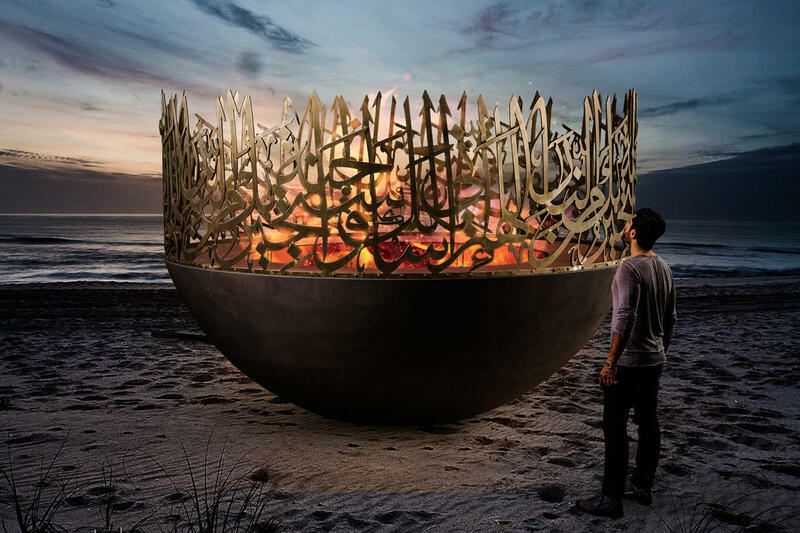 The LAHAB fire pit, made of brushed brass calligraphy and cement base. 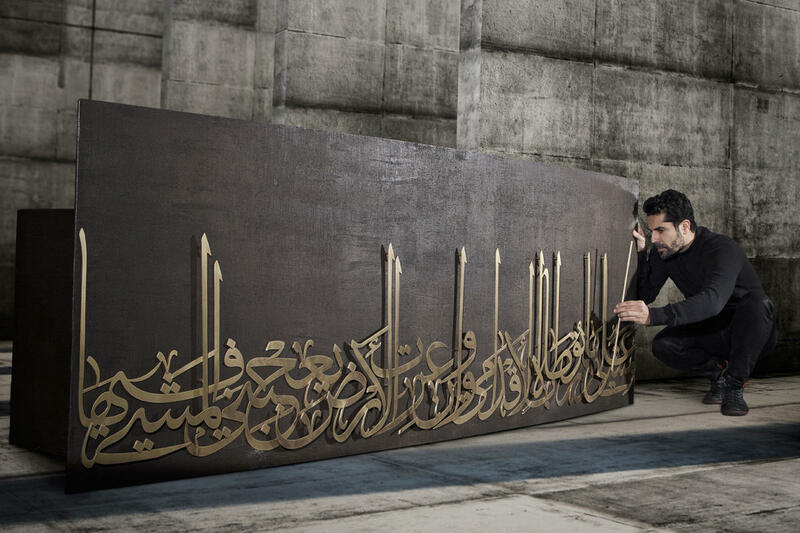 Naja shapes the Thuluth text out of brass or plated steel. The artist’s portfolio includes objects both purposeful and beautiful, such as mirrors, tables, chairs, lamps and bookshelves. An example of Naja’s exquisite lamps. Renowned international designer Iyad Naja is known for his ornate and original pieces for the home, which blend historical and modern, rough and pristine with a nod to the traditions that have shaped this region. Though he is already a presence on the design scene throughout the Middle East, Naja decided to take his skills to the next level by enrolling in the Mutaz & Rada Sawwaf Master of Islamic Art and Architecture at LAU’s School of Architecture and Design (SArD). Naja first joined LAU as an undergraduate and earned his BS in graphic design in 2000. 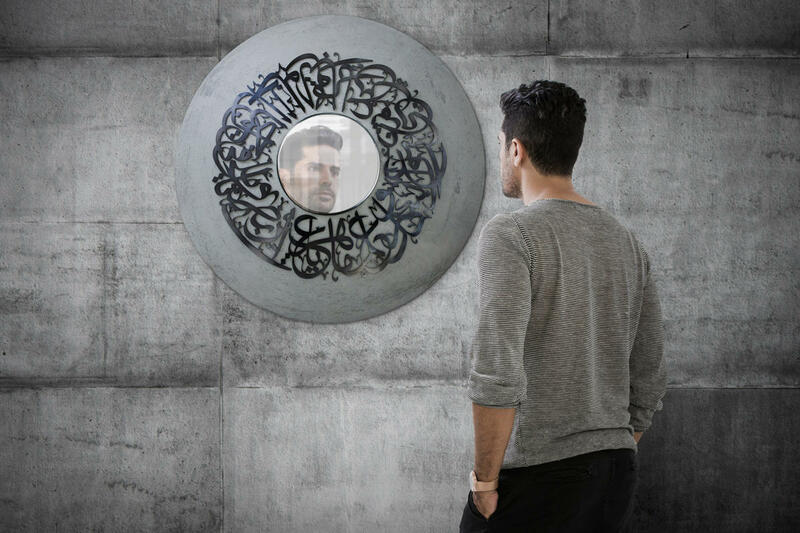 Before returning to work on his MA, he began making a name for himself with his highly original multimedia sculptures that feature detailed Arabic calligraphy juxtaposed with solid construction materials such as concrete. His portfolio includes objects both purposeful and beautiful, such as tables, chairs, lamps, bookshelves and mirrors. They are “functional art” as he likes to call them. 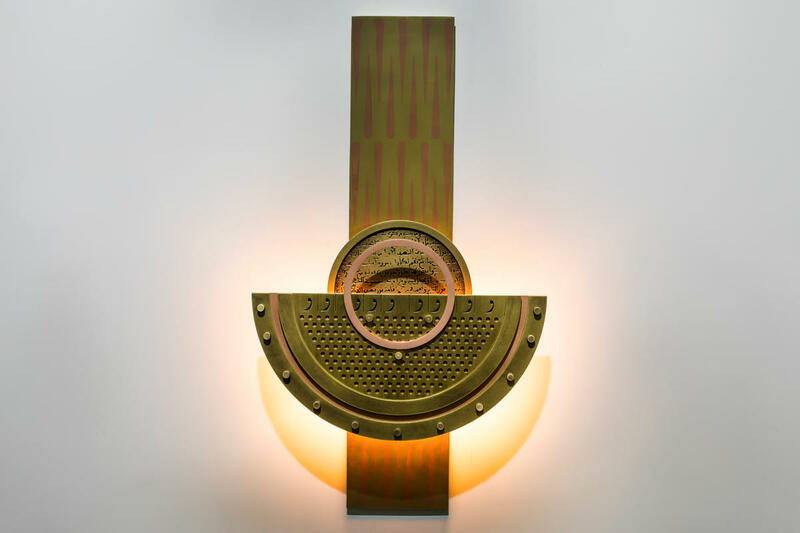 Naja’s evocation of Islamic art and history in his pieces has gotten him a lot of attention in the region, where more and more people are attempting to find authenticity in a market heavy with Western imports. Clients include members of the Saudi royal family and Imam and business magnate Aga Khan. Naja even has seven pieces at Harvard Law School in Boston. Naja credits the Mutaz & Rada Sawwaf Master of Islamic Art and Architecture with giving him a greater understanding of the artistic movements that shaped the Middle East, and thus, his work. The program explores the various artistic movements and historic periods in the development of Islamic art and architecture from Spain to India, including the Umayyad, Mamluk and Ottoman styles that developed in this region. The director of the program, Dr. Abdallah Kahil, emphasizes its focus on all aspects of Islamic art, including architecture, paintings, manuscripts and other objects. Students from all backgrounds are welcome, though many, like Naja, have previous degrees in design or art history. The program, remarks Dr. Kahil, dispels a lot of myths about Islamic art. For instance, Islamic art is not necessarily iconoclastic – or even religious. “Islamic art is quite simply an expression of the visual culture of the people who produce it,” says Dr. Kahil. Indeed, the study of Islamic art began in the late 19th century in Europe and included everything produced since the rise of Islam in the enormous area encompassing central and northern Africa, the Middle East, and central and southern Asia. “There is a huge variation in style and form by geographic area and time period,” he notes.